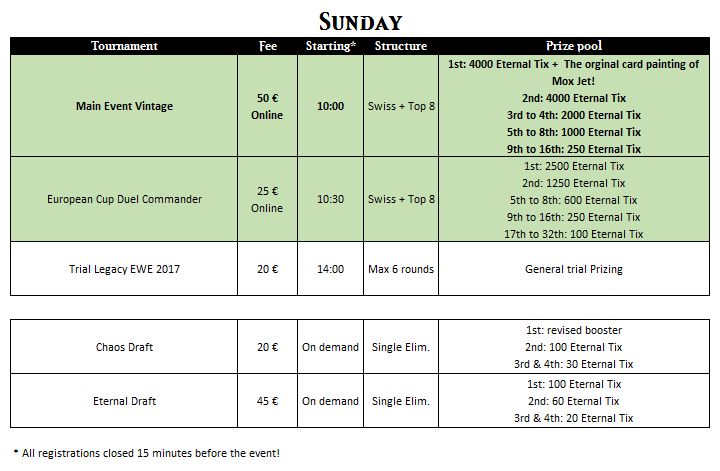 Premier Eternal week-end Européen, à Paris ! As the top8 approaches in the Duel Commander European Cup, we asked the players a couple questions about the format and the new 20-life rule ! What do you think about the new 20 life rule ? I like it, people can play more agressive commanders now. Cool card or deck you saw today : a 5 color Slivers deck. What do you think about the new 20 life rule ? I don't like it, it is very bad for control decks. What would you change to the current banlist ? Unban Tasigur, the Golden Fang ; Marath, Will of the Wilds ; and Oloro, Ageless Ascetic because they are not that good with 20 life. Cool card or deck you saw today : A Gitrog Monster deck. What do you think about the new 20 life rule ? 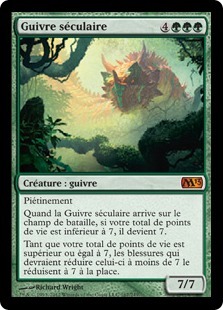 Very good, because without it, you could abuse cards using life like Sylvan Library, Phyrexian Arena, Dark Confidant, etc. Also Bolt is not only a removal spell now. What would you change to the current banlist ? Could be unbanned : Yawgmoth's Bargain, Mind Twist, Food Chain, Serra Avenger, Zur the Enchanter and Yisan, the Wanderer Bard. Also, Skullclamp should be banned. 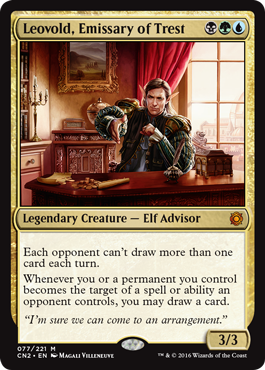 Cool card or deck you saw today : Leovold, Emissary of Trest + Timetwister ! What is the best Commander right now ? 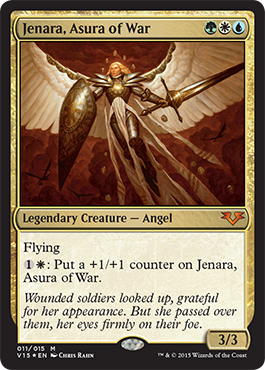 Jenara, Asura of War, even with the 20 life rule. 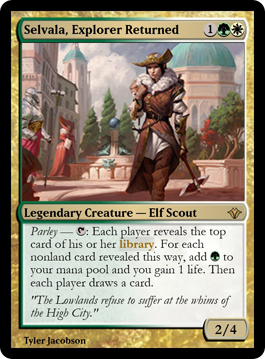 Narset Enlightened Master, Jace Vryn's Prodigy and Titania, Protector of Argoth are also good. 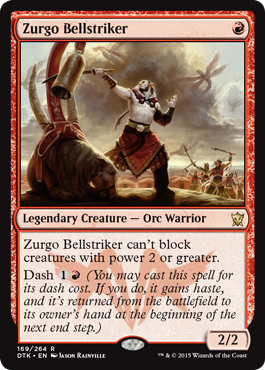 What is the best 2016 card for Duel Commander ? I like Leovold, Emissary of Trest. Also the Kaladesh fastlands, which enable more aggro decks. What do you think about the new 20 life rule ? We should have implemented it before, this is the single best thing that ever happened to the format ! - And above all, it makes life totals more of a ressource. What would you change to the current banlist ? Maybe ban Titania, Protector of Argoth ; maybe unban Tolarian Academy or Treasure Cruise. 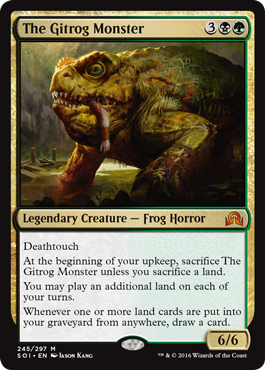 Cool card or deck you saw today : Gitrog Monster. 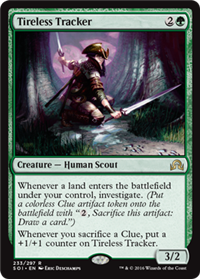 If you have 8 cards in hand, you can cycle all your lands in cleanup step ! What do you think about the new 20 life rule ? I love it ! It allows more combat phases and let you play commanders from all 5 colors, even agressive ones. What would you change to the current banlist ? Ban Gifts Ungiven, unban Treasure Cruise. Cool card or deck you saw today : Nothing special. After a couple rounds of Vintage,we already got a better glimpse at the actual state of the format. But what do the players think ? We asked a couple questions to Vintage fans or specialists, let's see their answers below ! Best recent card for Vintage ? Thought-Knot Seer. In fact, all the Eldrazis. 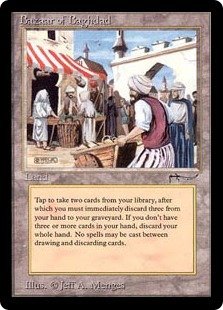 Cool card or play you saw today : I saw a really cool deck based on the combo between Bazaar of Baghdad and Uba Mask. 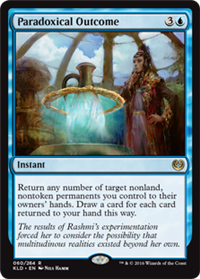 What would you restrict or unrestrict in Vintage ? Unrestrict Brainstorm. Best recent card for Vintage ? Fleetwheel Cruiser, better than Reality Smasher because of Workshop. 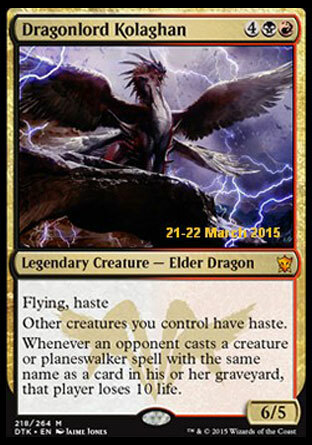 Cool card or play you saw today : Dragonlord Kolaghan out of Dredge. 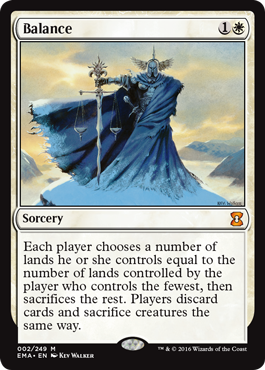 What would you restrict or unrestrict in Vintage ? Restrict Bazaar of Baghdad to kill dredge. Best Vintage deck ? Eldrazi, sadly. Cool card or play you saw today : My opponent played a Balance (which was really good), but does not see many play in Vintage. What would you restrict or unrestrict in Vintage ? Restrict some 2-mana lands. Best recent card for Vintage ? Paradoxical Outcome, huge potential. Cool card or play you saw today : I resolved an Ancestral Recall through a 8-spells counter war, then won with a hardcasted Griselbrand. 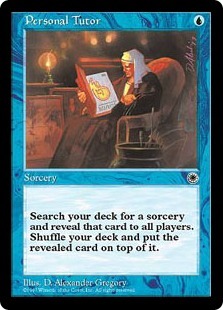 What would you restrict or unrestrict in Vintage ? Unrestrict Lodestone Golem. It was very powerful, but the format needs some prison decks to keep combo decks in check. Trying to understand Legacy better, we met some famous players between the rounds, and asked them a few questions about the format. Check their answers below ! What card(s) should be ban / uban in Legacy : Survival of the Fittest. Cool card or deck you saw today : A couple people are playing Slivers ! What card(s) should be ban / uban in Legacy : Top should be ban. Also, Survival of the Fittest and Earthcraft could be unban. Cool card or deck you saw today : Kozilek's Return. Also, Leovold, Emissary of Trest. 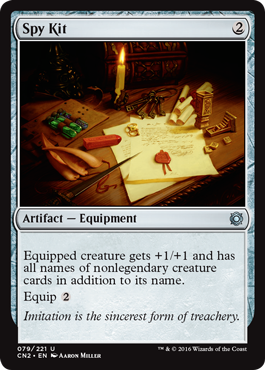 Cool card or deck you saw today : A UW Show and Tell deck, featuring Personal Tutor for Terminus. What card(s) should be ban / uban in Legacy : Mind Twist could be unban. Cool card or deck you saw today : A combo deck featuring Spy Kit and Mask of the Mimic. 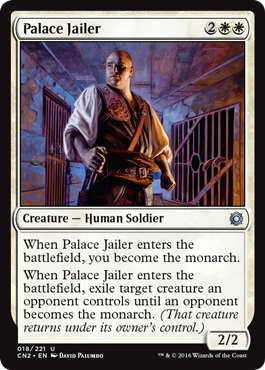 I also played against a Palace Jailer. What card(s) should be ban / uban in Legacy : Nothing, the format is fine right now. C'est parti pour le jour 2 de l'Eternal Weekend Paris 2016 ! Suivez notre compte twitter @BazaarOfMoxen pour les infos en direct ! 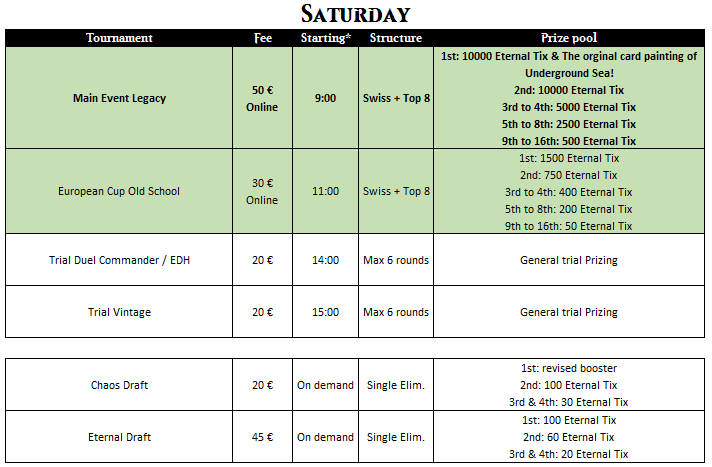 Bienvenue pour ce jour 1 de l'Eternal Weekend Paris 2016 ! Aujourd'hui, nous suivrons le Legacy Championship, avec pas moins de 294 joueurs, qui joueront donc 9 rondes avant le top8 qui désignera le Champion d'Europe Legacy ! En parallèle, 34 joueurs se sont retrouvés pour la European Cup Old School, pour les amateurs de cartes old frame, Power 9 et autres Chaos Orb. Les standings du Legacy Championship seront mis à jour régulièrement ici. Le Prize Wall est disponible ici ! Plus que quelques jours pour vous préinscrire ! We received feedbacks from couple of players asking if we were taking any actions regarding the safety of participants, because of the tragic events that happened in France this last year. The longest answer is the following one. 2) to reinforce our own team inside the building to double check that everything is fine. secured the bags under your seat when they are playing. To avoid any delay make sure to arrive at the venue at least 30 minutes before the event, time to pass the security and register for the event. Afterward, everything will be the same for you: playing Magic, having some good time with friends and trying to win the first Eternal Week-End hosted on this continent. Voici la carte des trials pour L'Eternal-Week End 2016. Si vous n'avez pas de trial proche de chez vous, invitez votre organisateur local à nous contacter pour qu'il en organise un. Joueurs et joueuses d'Eternal, soyez les bienvenu(e)s ! L'équipe de Bazaar of Moxen est heureuse de vous annoncer l'organisation du premier Eternal Week-End (ETW) en Europe en collaboration avec Wizards of the Coast ! Pour ceux d'entre vous qui ne connaissent pas l'ETW, il s'agit d'un week-end complet ayant pour but de réunir la communauté Eternal. Le vendredi, les joueurs pourront faire les ajustements finaux de leur decks en participant à des side events et des trials. 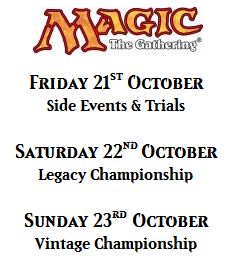 Le samedi, nous organiserons le Legacy championship et le dimanche le Vintage Championship. Tout au long du week-end, vous pourrez également profiter des désormais célèbres et toujours très demandés Chaos Draft ! Les vainqueurs des deux tournois principaux seront les Champions d'Europe de leur format ! En sus de ce titre prestigieux, les vainqueurs recevront une carte géante d'une carte emblématique du format. Nous sommes d'ores et déjà en mesure d'annoncer que chaque participant à l'un des deux Championship recevra un play mat officiel avec l'illustration d'un spoiler du format. Vous avez bien lu, il y aura deux play mats différents : l'un pour le Legacy et l'autre pour le Vintage ! Réservez déjà la date sur votre calendrier : L'événement aura lieu du 21 au 23 Octobre 2016 à l'Espace Charenton, 327, rue de Charenton 75012, dans Paris intra-muros. Détails et inscriptions à venir rapidement.